Business Trip to Bozeman - Take a Hike! 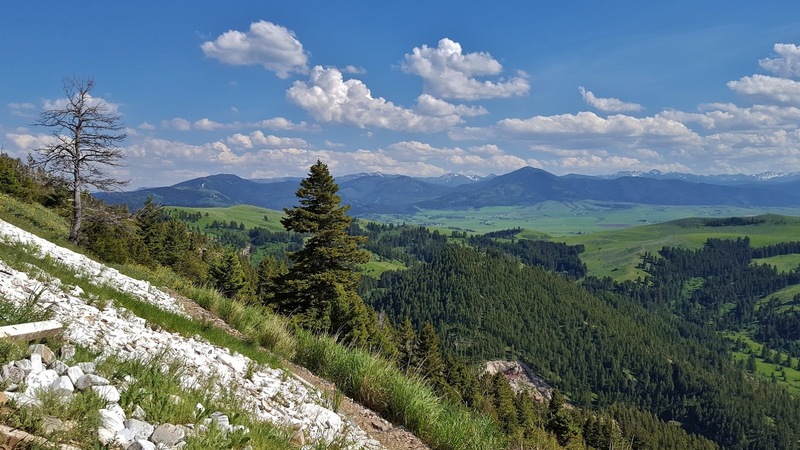 This week I headed to beautiful Bozeman, Montana for work. The last time I was here was in February and there was limited daylight. But this week, the sun didn’t set until after 9 so I tried to get out and see a little of the area after work each evening. I arrived at Bozeman at 1 local time and headed to the office. Getting off at about 5, I decided rather than going straight to the hotel and checking in, I would head south into the Hyalite Canyon area of Gallatin National Forest to see Palisade Falls. The drive in was absolutely beautiful. After passing the reservoir, I turned left on the gravel road and went about a mile to the trailhead for Palisade Falls. It was just a short hike on a paved trail to this stunning waterfall. The water tumbles down around eighty feet over some beautiful volcanic basalt cliffs. I got a couple pictures and then started heading back. On the way back, I saw a couple hiking up and thought the guy looked very familiar. Turns out it was my coworker Mark and his girlfriend, also heading up to the falls for an after work hike. Back at the car, I started heading back, making a quick stop at the Hyalite Reservoir. The views over the lake were just stunning. Despite high temperatures in the upper 80s, snow-capped mountains were visible in the distance. After a brief stop, I headed back to into Bozeman and checked in to the Holiday Inn Express, my home for the week, and retired for the evening. After work Tuesday, I headed to the “M” – perhaps Bozeman’s most popular hiking spot. I thought College M was a strange name for a National Forest hiking trail. Driving towards the trailhead on I-90, I saw the giant M on the side of the mountain and realized where the name came from. When I was here in February, the mountains were covered in snow and it wasn't visible. I parked at the trailhead, which was almost full and got ready. As I started hiking, there was a split and the sign indicated the easy way and the hard way. Of course I had to take the hard way. Gaining 850 vertical feet in a half-mile, this trail was exceedingly steep. The high temperatures and bright sunshine in Bozeman didn’t help. There was almost no shade on the trail. Although it seemed longer that it actually was, I made it to the top in about 20 minutes and stopped for a rest on the bench. 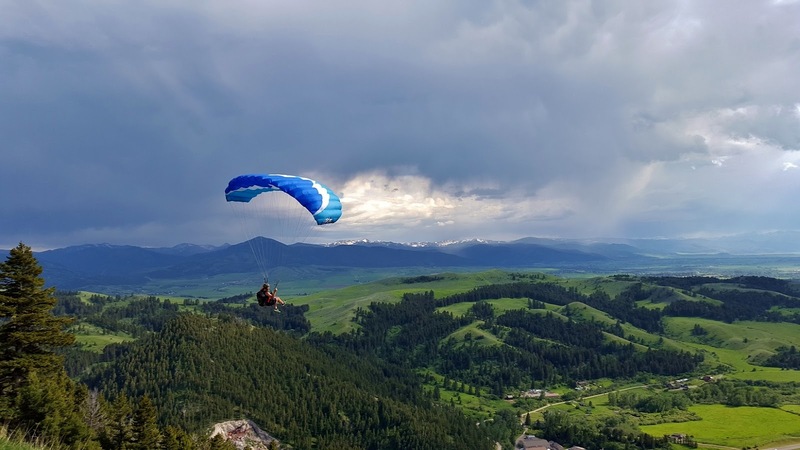 The views of Bozeman and the Gallatin Valley from here were just phenomenal. Looking up, I saw a guy on top of the M. He whipped out a parachute and jumped off, paragliding down to the valley. Now that's something you don't see every day. Well, maybe in Bozeman. Telling coworkers this the next day, they didn't seem to think it was too uncommon. After this, I started heading back down, taking the easy way this time. Beautiful wildflowers were blooming all along the trail. The penstemon were particularly beautiful. But the most abundant were the arrowleaf balsamroots. There must have been thousands of these pretty yellow wildflowers blooming on the mountainside. As I was heading down, a storm rolled in. 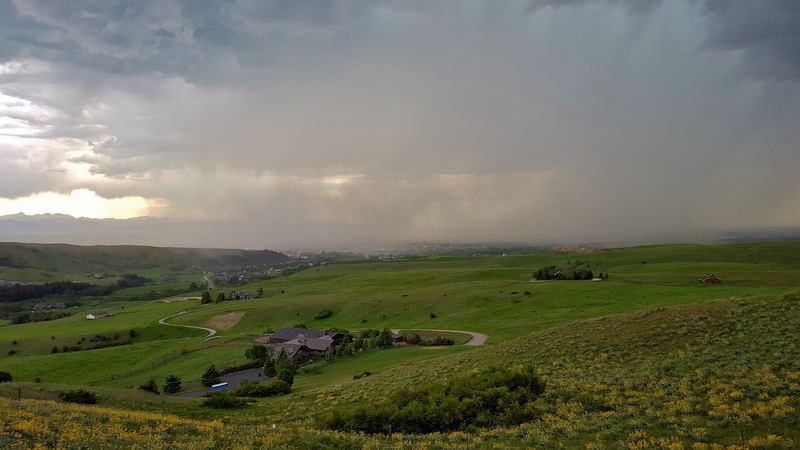 In a matter of minutes, I could no longer see Bozeman - it was getting slammed with rain. Fortunately, I was heading down so I picked up the pace, making it back to the car just as the rain was starting here at the Bridger Range. By the time I drove back into Bozeman, the rain stopped and I had dinner at Copper Whiskey, then returned to the hotel for the evening. Wednesday, I had a dinner to attend after work, so not a lot of time for hiking. I headed back to the M and this time took the easy way up, or at least started that way. In about a half-mile from the trailhead, I turned right on College M Shortcut (#512). Again today, I enjoyed seeing the countless wildflowers blanketing the mountainside as I hiked up the mountain. Unfortunately, the wildflowers bloom due to the lack of shade and it was another hot day today. 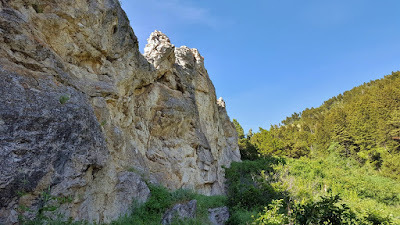 Along the shortcut trail, there was a rock outcrop that provided some shade for a short ways. Soon I made it to the M and stopped for a break to enjoy the view. After a quick break, I started heading back down, staying on College M Trail (#511). 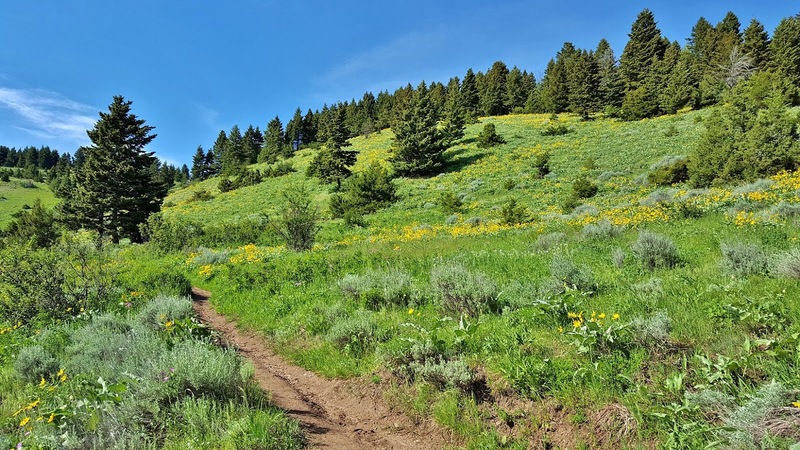 Near the bottom, I turned right on Bridger Foothills Trail (#534) and went a half-mile or so to see some more wildflowers. Heading back, I stopped one more time to see some beautiful lupine, then finished the hike back at the trailhead. Then I headed into town and met my coworkers at Feast for dinner. Thursday was my last day in Bozeman. After work, I headed south back into Hyalite Canyon, but this time heading to the trailhead for Grotto Falls. A lovely trail followed Hyalite Creek upstream to this waterfall. I presume there is a cave behind the waterfall, but the water level was really up today so I couldn't really see it. I stopped here to get a couple pictures, but wasn't ready to head back yet. A map at the trailhead indicated Arch Falls was just a little further up the creek. So I continued on the trail to try and find this waterfall. Looking across the gorge, Twin Falls was visible in the distance. This gorgeous double waterfall was very high. But it was hard to find a good place for a picture and I’m not sure how to get closer. A Forest Service sign indicated that it was a location for ice climbing, so there must be a way. But the creek level was way up today, so no way to cross. I didn't really have time anyway. It was just a short ways further to Arch Falls. I had to climb down a steep cliff to the base of this amazing waterfall. Although only 15 or 20 feet high, the water cascades down and flows under a natural rock arch. I’m so glad I continued on to see this one – I think it was my favorite of the week. It was really cold down in the little ravine with this waterfall. The fast moving water created a natural air conditioning - cold enough that a block of ice was near the base! I climbed back up and started making my way back. There were lots of lovely little trout lilies blooming along the forest floor. Unlike the trout lilies in North Carolina, these didn't have the trout-patterned leaves. I think that they're Glacier Lilies. It was just a little further back to the car and back at the hotel, I started getting packed up to head home in the morning.